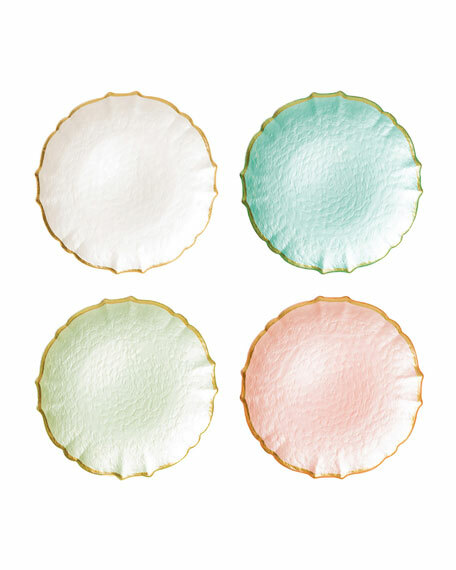 Set of four assorted salad plates. Limoges porcelain plate. Border has embossed lizard texture. 24-kt. gold trim. 8.3"Dia. Hand wash. Imported. Made of fine stoneware with handmade Lisboa decal application. Four-piece salad plate set. 8.5"W x 8.5"D x 1.1"T. Microwave/dishwasher safe. Made of fine stoneware with handmade Lisboa decal application. Four-piece salad plate set. 8.5"W x 8.5"D x 1.1"T. Microwave/dishwasher safe. Made in Portugal.